According to this month’s Ethical Corporation report, the drop in commodity prices will put pressure on extractives companies to cut back in all areas, including Corporate Social Responsibility (CSR). Sadler (2004: 852) describes CSR as “the notion that companies should accompany the pursuit of profit with good citizenship.” Society’s increased demand for CSR in the mining industry is considered inevitable due to the sector’s impacts on the environment and people (Kepore and Imbun, 2011). 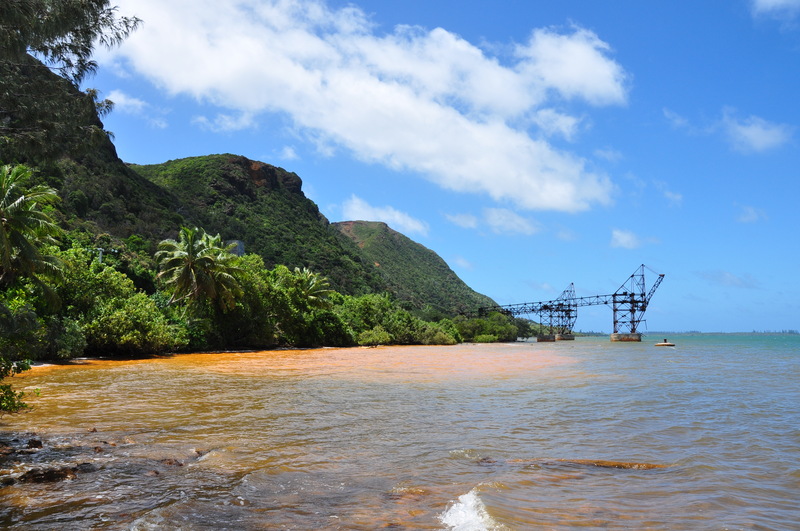 Mine in New Caledonia. Image credit: Fourrure via Wikimedia Commons. A paper by Leah Horowitz in the January 2015 issue of Transactions of the Institute of British Geographers, entitled, “Culturally articulated neoliberalisation: corporate social responsibility and the capture of indigenous legitimacy in New Caledonia,” develops our understanding of CSR as roll-out neoliberalism. It considers CSR as elements of a capitalist system actively working to create its own social regularization in order to secure a geographically specific socio-politico-economic context that supports (or at least, does not prevent) capitalist development. CSR can thus re-legitimise market-led development and counter resistance. Horowitz argues that processes of neoliberalisation must articulate with specific politico-economic conditions and also with cultural ideologies and local hegemonic relationships. Horowitz’s ethnographic analysis of an indigenous protest group (Rhéébù Nùù, meaning ‘eye of the country’) that targeted a multinational mining project in New Caledonia describes how the company undercut and ultimately co-opted local resistance, through its ability to successfully capture culturally-based ideologies of customary and indigenous legitimacy. Neoliberalisation’s articulations may therefore involve attempts to capture both formal and informal regulation or regulators, through direct benefits and indirectly by capturing culturally valued ideologies. These ideologies then interact with culturally grounded hegemonic processes. Horowitz goes on to explore different forms of hegemony, based in distinct cultural formations, and how they interact with each other as well as with counter-hegemonic forces. Through the company’s direct engagement with customary authorities, rather than exclusively with activists, it was able to delegitimise the activist opponents and reposition them as subordinates within their own culturally informed social hierarchy. Although some customary authorities were sympathetic to protestors’ aims, the privileged hegemonic status of customary authorities was re-instated, and the company re-legitimised itself. Ethical Corporation (2015) Commodity Prices Briefing: Building a CSR strategy during an era of low commodity prices. Kevin P. Kepore and Benedict Y. Imbun (2011). Mining and stakeholder engagement discourse in a Papua New Guinea mine. Corporate Social Responsibility and Environmental Management. 18(4) 220–233. Leah S. Horowitz (2015). Culturally articulated neoliberalisation: Corporate social responsibility and the capture of indigenous legitimacy in New Caledonia. Transactions of the Institute of British Geographers. 40(1) 88–101. David Sadler (2004). Anti-corporate Campaigning and Corporate “Social” Responsibility: Towards Alternative Spaces of Citizenship? Antipode. 36(5) 851–870. This entry was posted in Transactions of the Institute of British Geographers and tagged corporate social responsibility, CSR, Extractive industry, indigenous communities, Mining, neoliberalisation, neoliberalism, New Caledonia, protests on January 16, 2015 by izabeladelabre.